Everyone is searching for the true answer to good skin. Within this article, is information about the factors that can influence our skin to not look its best. Knowing what not to do, is often the best way of illustrating what to do. When advising clients regarding their skin condition over the years, we have visibly seen that skin is a living organ - through our biological treatment approach. Our skin is our largest living organ, therefore it makes sense to consider it's care. We say that, Our skin is also a reflection of what is going on in our bodies. There are many factors which influence the optimal health of our skin. Facial skincare is a priority to many of us, as this is the part of our skin that is most seen by others. Self-image is also important and the way that we feel about our skin can influence our general mood. Our head is said to consume on average 20% of the calories that we consume, which is relatively high, when taking into consideration its proportion to the rest of our total mass. This is due to our sensory communication (smell, hearing, taste, sight, balance and touch) being centered there alongside memory, current thought, future contemplation and other processing for numerous other communicative mechanisms within our bodies. Cells, tissue and therefore skin & hair regeneration have to share the available resources, oxygen and waste removal within this category. There are genetic priorities on an individual basis, which may be learned through an individual's life or due to predispositions. Individuals may exhibit quite different orders of priority in terms of their skin & hair depending on internal/external influences which can be completely different to their inherent traits. Since we are thinking about oxygen supply and toxin drainage, we have to consider allowing maximum transport channels to be open and get as much as we can in. There are two main arteries that supply blood, oxygen & nutrient (from our diets) to the head. Restrictions within blood supply can reduce the efficiency of how we process information, influence negative mind-sets as well as slow down the rate of cell metabolism. Toxin drainage can also be restricted and have similar effects as to lower mood and reduce metabolic processes. It is crucial that the muscles in the neck and upper body are relaxed regularly (via stretching such as yoga/massage). Contracted muscles can trap toxins and reduce blood circulation (resulting in aches and pains). Aches, muscle tension and pains are a way that our body will communicate with us, so that we administer some care. We recommend the use of a fibre scrub mitt as a bare minimum (as you are regularly massaging) on a daily basis to facilitate blood circulation and toxin drainage.- the whole seeing/feeling is believing. In an ideal, balanced life, yoga should be done every day at night (just prior to regenerating whilst sleeping). Breathing within itself is something that most people fail to do properly. You are probably thinking yeah right how do we live then! We said PROPERLY, as with everything that is done to the best of your ability - the outcome will also be optimal. When we breathe a muscle that is called your diaphragm is pulled flat and that causes a cascade of actions that draws air into our lungs, our rib cage expands and allows free flow. Due to our diaphragm being pulled flat, it kind of pushes our bellies outwards and this is where the problem has arisen. The image conscious society we live in, means that some individuals constantly tense their abdominal muscles to look slimmer, alternatively some people are so busy talking that they take quick gasps and deprive themselves of air or they are so engrossed in what they are doing that they kind of forget. Breathing should be something done innately (something done without thinking) but sadly a lot of people can program themselves not to breath properly. Please see the breathing technique on our sleep blog, to start to learn how we can breath efficiently again. The reason for us saying again, is that as babies, we had to learn how to breath - don't take our word for it - and watch a baby sleep and you will see its belly moves up and down during respiration (the process of breathing). Breath properly and stretch muscles to allow free flow within our circulatory systems. We need to look after what we eat in terms of food, which we are all aware of already. Although our lifestyles and priorities can often cause us to focus on other things and neglect ourselves. As children, most of us are lucky to have parents whom plan out our meals, taking into account their nutritional value. We may even be doing the same for our children, but as parents we put ourselves last. When trying to build our lives, we can be so work driven, that we consume the nearest thing to hand, without consideration of its nutritional value. We are what we eat! Nutrient sources can have different effects on our mood and sadly we also have to consider the toxic content of the food we can consume. When we eat food with colorants, preservatives and other additives, they may trigger mechanisms on an individual basis that can put pressures on our organs and potentially lead to disease in the long run. When we awake, we have to eat something to start our metabolic processes (many skip breakfast). Different lifestyles and habits that we maintain, mean that we need to consume calories equal to the energy we require. For a healthy metabolism in terms of cell renewal, we need to teach our bodies to efficiently use the nutrients we supply and control the amount of toxins we digest. Ayurvedic practice specifies, our diet needs to be altered depending on the season and our stage of life, working with natural laws to adapt our food habits. Natural food sources are the best as they pose no potential risks to your health in the long term - due to having no artificial toxins. Natural chemicals have many proteins, that are identical in composition to essential amino acid structures found within our bodies. Food sources can also facilitate many reactions to happen more efficiently due to our requirement for protein, sugars, carbohydrates, fats, vitamins, minerals & fibre. 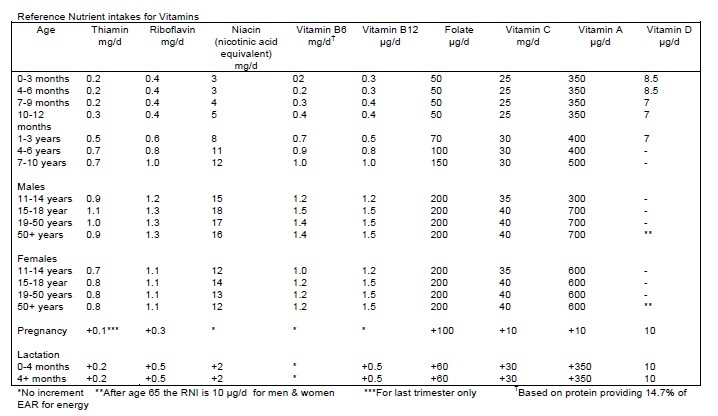 Above are tables that give you an indication of variation of vitamin & mineral requirements, depending on your age and gender (these are averages, but give you an indication that scientists have actually spend lots of time and effort to give us guidelines for good health). Eat to live and don't live to eat. We have to understand food and its purpose foremost. We need food so that our bodies have all the tools and supplies to build healthy skin, hair & body (cells). Eat according to the season (for example: salads in summer, soups in winter) as changes in external temperatures effects the rate of digestion of food, in turn making nutrient absorption easier. Eat small portions, often and think about having a balanced amount of protein, sugars, carbohydrates, fats, vitamins, minerals & fibre (not in one meal but throughout the day - don't worry if you miss something as vegetables usually cover it). Eating smaller portions will lead to your fat storage mechanisms to be less likely to store fat. When you store less fat, your body looks leaner, biological mechanisms are more efficient and so care of your skin is seen externally. Vary your diet and don't eat the same thing daily, as this will also shock your metabolism, so that you get the most out of the food sources taken in. Eat simply, naturally & often. We can think to much, worry to too much, care too much and yet we have never heard that too much happiness was a bad thing. We can look at other people whom portray a happy outlook on life and naturally feel envious, as we wish to feel the same. Possessions and status can cause stress, as we compare ourselves to others - what we forget is that we are not them. Different things make different people happy, we are born and the first thing we learn is to be happy. Babies are happy as they receive food, a comfortable state (content in self) and affection from loved ones, but cry when they don't receive what they want or are in fear. As adults we are not to different really, we simply look for happiness and spend our lives trying to attain/maintain that state. Hormones are the little messengers within our bodies that do the leg work to change our mood, but we are the masters of their actions really (as long as you don't take any medication to alter their paths). Our skin is radiant, when we are relaxed and happy. If we are stressed and unhappy, we feel that we do not look so good. This in turn makes us feel worse, as we say in our heads, we don't look good so we feel bad - as maybe, other factors alongside our appearance are effecting us. Hormones change depending on our mood or feeling (that's their job) and can alter metabolic reactions within our body as a order of priority (depending on individual susceptibilities). Psychosomatic medicine research has proven that our psychological state effects biological mechanisms within our bodies. Negative thought processes have detrimental effects, whereas positive thoughts can facilitate healing, growth, cell reproduction, repel illness & infection, balance dietary consumption and overall increase your well being. When thinking about your skin or appearance, don't think negative (seek professional, natural, advice, and be skeptic about methods of treatment or care). Ensure that prior to any treatment, lotion or potion, dietary or lifestyle change, that you are fully informed about risks or alternatives. If you are anxious or stressed about anything, work towards a way to remedy the problem by giving your mind some calm. Most things cannot be changed immediately and worrying about them makes the matter worse (long term negative mindsets can result in disease). Take some time to listen to music, meditate or whatever else floats your boat. Feel free to have a read of our blog on changing the way that we think about stress. Learning to think positively and maintain balance can be a slow process depending on the individual, but keep trying and eventually you will build up natural mechanisms to cope with things better. Taking medication can be an option for some people, but we do not advise this - you are often swapping one problem for various others later in life (medication effects metabolic pathways in negative ways, as well as the obvious benefit on the packaging). Don't think negative and control your thoughts, you look better if you think well. Don't be hard on yourself as changes in mindset happen over time, with reinforced conditioning. Skin care as well as body care happens naturally as we sleep. This dormant state is something all living creatures do to rejuvenate their cells and tissues. When we sleep well, we awake rejuvenated and in turn our skin, hair, body & mind deal with life in a more organised and positive, courageous manner. As we explained previously about our mood - a bad nights sleep will influence hormones to cause our skin to look dull and tired. There have been many studies done on the brain, sleep and length of time that we sleep. The amount of sleep really does vary depending on the individual and how much they exert themselves within the day. A lot of clients say they sleep well, but we have come to the conclusion that sleep quality should be measured rather than the time in bed. An individual whom goes to sleep with lots of things on their mind whom hasn't actually switched off from the day is suffering from sleep deprivation . Their skin may have changes in blood circulation (redness), differing pigment levels (darker/lighter skin) or susceptibility to infection (more breakouts). This is due to the individual having their immune system triggered as a protective mechanism due to being in a drained state. Long-term sleep deficiency can lead to many other lifestyle related issues and disease. Everyone can recall having a good nights sleep so look at the factors which induced that good night and try to arrange it to be possible (at least 6 days a week to allow yourself a night off). To achieve a good nights sleep, plan to achieve a rested state prior to sleeping and switch off your mind, preparing for regeneration. If a good nights sleep is not possible due to other commitments work towards caring for your sleep. Please feel free to read our sleep blog for advice & tips on a technique for a good nights sleep. Sometimes cuddling up to your partner may achieve the same things as outlined in our sleep blog. Don't compare yourself to others (in terms of sleeping hours) and make sure 6 days a week, you awake feeling fresh and rejuvenated. The most common thing that people say, when we ask about their skin health is that they drink lots of water. Numerous individuals ask us about drinking water and a recommended level for optimal. We have issues answering this question due to the scientific basis behind hydration and it not being possible to accurately give advice without knowing their exact diet and lifestyle habits. Many people whom have spent their life drinking water in tea or in food only, start to drink lots of water and simply end up on the toilet a lot. Water is needed for most metabolic processes in the body, having it in abundance can increase metabolic processes. Here is the down side - too many minerals in water (chemically added) can have a toxic effect on cells as it is not naturally occurring. Alkali water which is relatively new to the aesthetics market can cause rupturing of cell walls (in excess and depending on the individual) due to the natural balance that exists in terms of pH. However, they are marketing alkali water as being more hydrating and sadly most people want a easy quick fix to health (be careful). The definition of hydration is literally the process of water being combined with a chemical compound. This is why we are under the impression that we have to drink water to be healthier. Water being available within our bodies, facilitates metabolic reactions by allowing hydration of chemicals to happen more readily. This will mean that toxin drainage and cell production is also more efficient. Tap water and bottled water is processed and contains chemicals that can have a negative effect on our bodies. When making a change or adapting life for the better, we have to take time to ensure that it is possible. We say this due to the fact that people over the years (as well as ourselves) have taught us, that they know what they are doing wrong, but sticking to improvement is difficult. When wanting to improve our health we think drink lots of water, but their actual requirement depends on the individual and their lifestyle. Fruits, salad, vegetables and other sources of food have a high water content, so you can consume these to intake your water and these sources will also have nutrients within them and have less side effects than drinking water. Make sure that your body is getting enough water to flush out toxins, but not to keep you in the WC. Consider consuming water from naturally hydrated food sources. Our human bodies are the most complex machines that exist on this earth. As we have discussed our heads & oxygen, diet, mindset, sleep and hydration, we now have to consider action and mobility. Posture is important as it plays a role in the free flow of chemicals required for life (whether they are for communication, processing or action). Just like a machine, we have to use our bodies regularly or they will need care before use. Our brains store habits on our metabolic lives. Say for example, if you do not do any exercise, mind tells cells: not much food needed and store more fat and vice versa, if you are very active, mind tells cells: need more food and store less fat. Our cells need to be taught to turnover quicker or slower and that is the key to looking better. Higher cell turnover means the body is renewing itself more and regeneration happens more efficiently. Using our machines properly and with care, will also ensure that all of its parts are in good working order. Our body systems overlap and each cell type functions as a team player in a very big game! We are not as we appear and just because you look slim or athletic in clothes, does not give a true reflection of someones metabolic health. Our skin can change depending on metabolic processes occurring however, we become more sensitive and can trigger defense mechanisms whatever they may be (this can vary depending on the individual). Some fatter people actually do more exercise than skinnier people, they may have simply taught their bodies to store more fat. Exercise is needed for health of our cardiovascular system and to ensure that our bodies are producing energy to use cells for their appropriate function. Each day we should use our bodies to do at least 20 minutes of exercise and stretch the muscles we use afterwards to release toxins that may cause damage. Studies have proven that stretching after exercise prevents muscular damage and increases the health of our bodies. 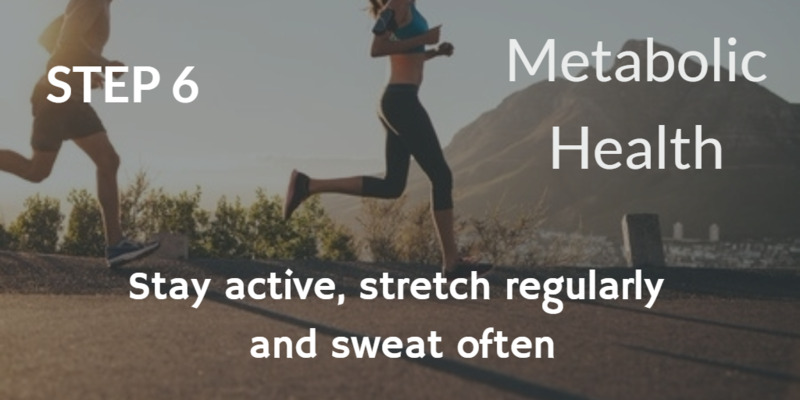 When sweating we excrete toxins and also naturally nourish/moisturise the layers of our skin. Sweat is like a flushing out process within our bodies and this can help the skin look and feel softer. Be active daily to ensure that you are strengthening your body and increasing your endurance. This will help your body to be equipped to deal with most things in life, without suffering long term damage from negative stimulus's. Being a skin clinic over the years has taught us a lot. Your external skin gives an indication to what is going on inside, but there is a complication. This issue is what we are being exposed to in the environment, which is against natural balance and internal biological mechanisms. Sometimes the condition of the skin can be easily enhanced when implementing one/some/all of the above internal skin care routes. The skin is really a protective barrier that holds our bodies together (with the help of muscles and special tissues) and reacts to changes in environment to regulate us. Homeostasis is regulation of our internal environment - temperature, pH & chemical levels, nerve cells can communicate the environment outside to change reactions within our body so that we maintain equilibrium (to the best of our ability). As years pass, population, deforestation and industrialisation increases, we damage our ozone layer allowing penetration of increased levels in radiation (which increases sensitisation of our skin barrier for exposed areas, most commonly the face & hands). The sensitisation of our skin means that you are more at risk of skin protein damage, pigmentation, broken capillaries, skin inflammations, surface damage and crusting of outer layers as a protective mechanism (depending on your individual susceptibilities). Chemicals within personal care products that come into contact with our skin, can sensitize the surface, as well as penetrate through pores into our bloodstream. Many of the additives in most high street products are not actually beneficial to your skin but are included due to financial viability and profit - can be very dangerous long term to your health. The least that you can do, is never use a product that does not make you look and feel better about your skin. If your buying a big brand for the smell but not receiving benefits - then clean your limescale in your toilet with it for a beneficial purpose. Natural chemicals do not have long term side effects, so keep it simple. We recommend washing with a cold pressed soap and moisturising with a good moisturiser. Whenever exposing your skin to the environment, make sure that we use a protective barrier and also research more into the products and services undertaken. Do not become an amateur natural chemist (they are chemicals none the less and can react with each other and your skin) unless you know what your doing. Protect your natural skin barrier with balance and nature, to ensure that you are not sensitized by external stimuli. Clear Medical was founded by Nadia and her background is molecular biology. She set out to provide a trusted resource for skin, hair & body care and is supported by a dedicated team whom share the goal of being true to ourselves & others, giving people confidence and helping them receive the care that they deserve. Clear Medical currently offers free advice, skin treatments, holistic therapies & clinical psychology services. Individuals whom work within Clear Medical, share the same ethos and do not promote short term-fixes and aim to offer the highest standards of care, to improve the quality of life for its clients.